Road and rail connectivity are key to ensure progress in hill states like Uttarakhand which is situated on the southern slopes of the mighty Himalayas. While industries depend on a good transport system to function effectively, the residents need a reliable and safe vehicular service to reach far flung areas. People in rural areas which are bereft of social facilities like hospitals and schools depend solely on bus services and other forms of public transport to reach district headquarters. Given the topography of Uttarakhand, roads are crucial for the hill people as they depend on plains for better their livelihood needs. Despite various efforts by the state and central governments, a lot needs to be done to improve the road connectivity in the remote areas of the state, especially those bordering the Tibet province in China. PWD, BRTF (Border Road Task Force), local bodies and other prominent authorities inthe state are entrusted with the task of road maintenance. 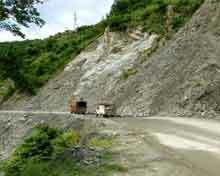 Total road network in Uttarakhand was 38,680.92 km as of 2013-14. Out of the total road length, 27,693 km is maintained by PWD while 1,281.32 km is maintained by BRTF. About 2,902.68 km road length is maintained by the local bodies and remaining is maintained by other departments in the state. The State Road Transport Corporation (SRTC), which has been reorganised as the Uttarakhand Transport Corporation (UTC) is a major constituent of the transportation system in the state. The corporation began its operation on 31 October 2003 and provides bus services on inter-state and nationalised routes. UTC is a PSU-owned transport corporation providing services in Uttarakhand and other adjoining states in North India. With a fleet size of around 1,143 buses, UTC operates over 3.50 lakh km catering to the travel needs of over 1 lakh people every day. UTC buses ply on 35 nationalised routes and district roads, besides connecting neighbouring states with regular services. It provides adequate, efficient, well-co-ordinated, comfortable and economical services to passengers, while earning enough for sustainable growth in Uttarakhand. There are also private transport operators running nearly 3,000 buses on non-nationalised routes along with a few interstate routes in Uttarakhand and the neighbouring state of Uttar Pradesh. For travelling locally, the state has autorickshaws and cycle rickshaws. In addition, remote towns and villages in the hills are connected to important road junctions and bus routes by a vast network of crowded share jeeps. Uttarakhand had 345 km of rail routes in 2013-14. 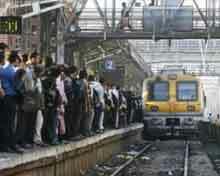 The state is focusing on increasing the share of railways in cargo and passenger transport. Initiatives have been undertaken to start monorails at Dehradun, Haridwar and Rishikesh on the inter-city linkage routes. The main railway stations in the state are Dehradun, Haridwar, Roorkee, Kotdwar, Kashipur, Udham Singh Nagar, Haldwani, Ramnagar and Kathgodam. In July 2014, the railway minister announced plans to start two new trains that will connect the state to Agra and Rameshwaram. Moreover, a proposal was put up for a rail connection to 'chaar dham’, the pilgrim circuit. As of 2014-15, the state government of Uttarakhand is planning to launch a rail project between Rishikesh and Karanprayag. The length of the railway track would be around 12 km. As over 86% of Uttarakhand's terrain consists of hills, railway services are very limited in the state and are largely confined to the plains. Rail, being the cheapest mode of transport, is most popular. 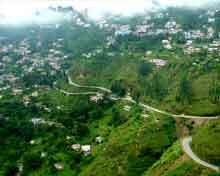 The most important railway station in Kumaun division is at Kathgodam, 35 km from Nainital. Kathgodam is the last terminus of the broad gauge line of North East Railways that connects Nainital with Delhi, Dehradun, and Howrah. Other notable railway stations are at Pantnagar, Lalkuan and Haldwani. Dehradun railway station is a railhead of the Northern Railways. Haridwar station is situated on the Delhi–Dehradun and Howrah–Dehradun railway lines. One of the main railheads of the Northern Railways, Haridwar Junction (railway station) is connected by meter gauge and broad gauge lines. Roorkee comes under Northern Railway region on the main Punjab – Mughal Sarai trunk route and is connected to major Indian cities. Other railheads are Rishikesh, Kotdwar and Ramnagar linked to Delhi by daily trains. Uttarakhand has two domestic airports. One at Jolly Grant in Dehradun district and another at Pant Nagar in Udham Singh Nagar district. In 2013-14, the passenger traffic of Jolly Grant airport was 3,06,832, whereas the traffic for Pant Nagar airport was 114. In 2014-15, Jolly Grant airport recorded passenger traffic of 3,78,646 passengers, whereas, the aircraft movement and cargo handled by the airport was 4,810 and 43 tonnes respectively. The air transport network in the state is gradually improving. Jolly Grant Airport is the busiest airport in the state with six daily flights to Delhi Airport. Pantnagar Airport of the Kumaon region has one daily air service to Delhi and return too. The government is planning to develop Naini Saini Airport in Pithoragarh, BharkotAirport in Chinyalisaur in Uttarkashi district and Gauchar Airport in Gauchar, Chamolidistrict. There are plans to launch helipad service in Pantnagar and Jolly Grant Airports and other important tourist destinations like Ghangaria and Hemkund Sahib. All flights connect the state to Delhi. Upgradation work has been completed at the Jolly Grant airport in coordination with Airports Authority of India. Due to the hilly terrain, the government has proposed the construction of at least one helipad per district. The state intends to position flight services as a reliable all-weather transport option for the hills. As of June 2015, the state had an installed power generation capacity of 3,177.27 MW, which consisted of 1,315.02 MW under state sector, 1,010.45 MW under private sector and 851.80 MW under the central sector. The installed power generation capacity in the state has increased from 2,383.00 MW in 2008-09 to 3,177.27 MW in 2014-15. Of the total installed capacity, 2,441.82 MW was contributed by hydropower, 468.85 MW was contributed by thermal power, 22.28 MW was nuclear and renewable power contributed 244.32 MW of capacity. The state is in the process of implementing and testing the PPP model in the power sector. As of March 2015, the state had achieved 99.3% of village electrification, covering 15,638 villages. The Uttarakhand Power Corporation Limited (UPCL) was formed to manage electricity transmission and distribution in the state after Uttarakhand’s separation fromUttar Pradesh in 2000. 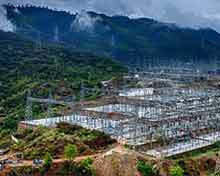 The transmission function was later entrusted to Power Transmission Corporation of Uttarakhand Ltd (PTCUL). Uttarakhand Jal Vidyut Nigam Limited (UJVNL) controls the state’s hydropower generation. The state’s power sector is regulated by the Uttarakhand Electricity Regulatory Commission (UERC). Uttarakhand is being developed as an ‘Energy State’ to tap its huge potential. The state government has also supported the development of alternate sources of power generation such as solar energy and energy from bio-gas plants. A state-level energy park has also been established in Dehradun. Industry is a major power consumption segment followed by domestic consumers in the state. There are 34 hydropower projects being developed by Uttarakhand Jal Vidyut Nigam Ltd (UJVNL) with an estimated potential of 1,305.9 MW of power under state sector. The state has a well-developed communication network including both wired and wireless connectivity. As per Telecom Regulatory Authority of India (TRAI), the state had 0.46 million wire-line subscribers and 52.57 million wireless subscribers as of May 2015. As of 2014-15, the state had 473 telephone exchanges. Uttarakhand State Wide Area Network (USWAN) is operational in the state. Some of the projects under Information Technology Development Agency (ITDA)are National e-Governance Plan (NeGP), capacity building project, common service centre (CSC) and state data centre (SDC).